There is no need for you to pay more for supplies just to get the word "DuraLabel" on the outside of the package. Inside you'll find the exact same quality. 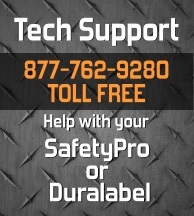 We have the best price on DuraLabel supplies, as well as the new, upgraded SafetyPro models that work with the same low-priced labeling materials. Do You Already Own a DuraLabel Printer? The SafetyPro Labeling System beats the DuraLabel in speed and quality. If you already own a DuraLabel printer, we can supply you with quality, durable vinyl at a 30-50% savings off what you are paying today. Now you can save hundreds or even thousands of dollars on your supply orders! 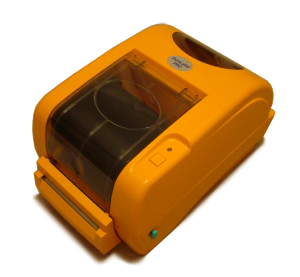 Ask about special DuraLabel trade-in deals, available on all models of the DuraLabel label printer. What About Brady MiniMark, Brady GlobalMark or Brady PowerMark Printers? 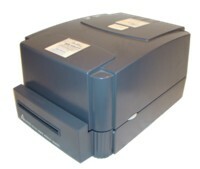 Brady label printers are very common, and so are the complaints against them. If you're tired of your Brady label printer and the high cost of supplies, we would be happy to replace your Brady label printer with our generous trade-in program. We can get you out of that expensive Brady GlobalMark and into a durable, indutrial SafetyPro labeling system. We even offer trade-in value on partially used or unused supplies.